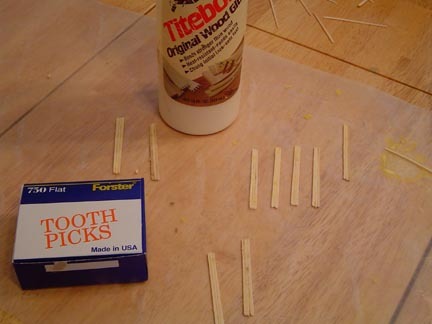 A friend of mine asked me to help her son with the classic math/science project, the toothpick bridge. At the time, I remembered my dad's explanation of a catenary and I decided to look into that curve as a building block of the design. The catenary is curve made by a hanging chain. A fancy description would be the 'shape assumed by a rope or chain of uniform density suspended from two points and acted upon solely by the forces of gravity.' The Saint Louis arch is the shape of a catenary. 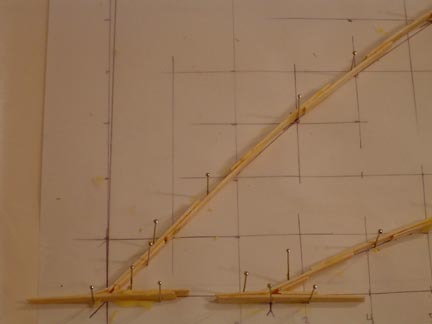 At that time, we designed and built the bridge, but in the interest of getting it built, we did not use the formula for a catenary, I think we simply dangled a chain ( like the ones the pens are attached to at the bank) in front of a posterboard and drew the curve. When my son came home from 8th grade with the same assignment, I thought I would document our process on a web page. 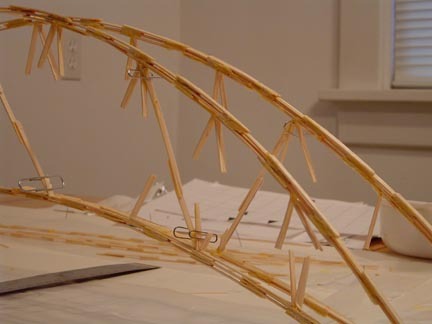 A school project, usually assigned in a physics class, or math class for junior high or high school students, The "Toothpick Bridge" problems tests the reasoning skills of kids and future engineers. The design relies on the four catenary arches to transfer the weight of a load to the four feet on each side of the bridge. 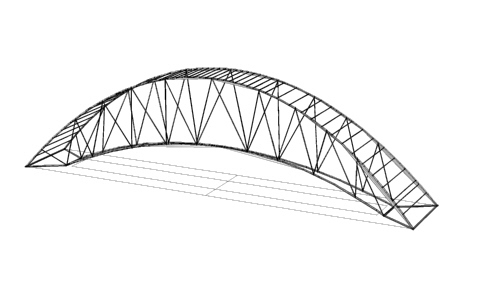 They work in tandem like a regular truss with struts that connect the upper arches to the lower archs. The formula for a catenary arch is y=cosh(x). This 'cosh' function is the hyperbolic cosine. A sort of obscure trigonometric function used in non-euclidean geometry. Luckily, it's on many hand-held calcualtors. You know, I really put these pages on my website as an experiment, but since so many people view the page, I thought I might try to resolve a question that always arises when defining this problem. What are the strengths of the individual elements? Well, you have tiny sticks of wood, and white glue. Well, I needed glue for woodworking anyway, so when I went to Lowes to buy the glue, I thought,"hey, why not buy several types -- and test them to see which one is the strongest!". Construction technique is of great importance to success. 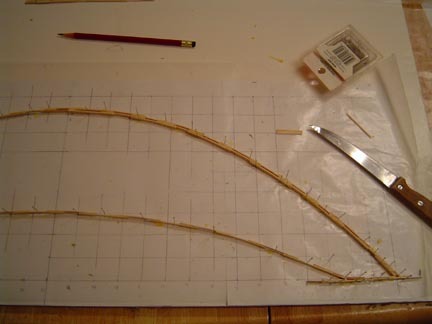 I decided to make easier building blocks by first gluing toothpick 'head to toe', as it were, and by putting the fat end and the skinny end together, we get a uniform width, flat, and stronger, building block. Make longer pieces from the building blocks. 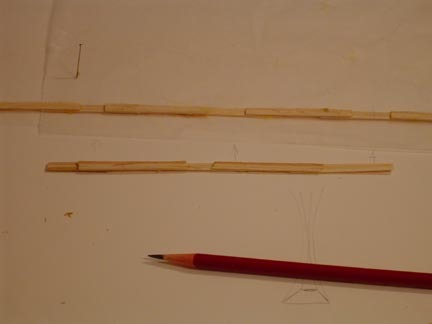 Many Many toothpicks are needed. Every glue joint is important. Think of each place where building blocks are glued together as 'rivets' in your bridge. In the most efficient design, every part of the bridge is acting on the force of the load. If the bridge is overdesigned, then sloppy workmanship will suffice. There is a balance between design and safety. With modern computing and engineering techiniques, some designs actually fail because they forgot some subtle force, such as wind. The Tachoma narrows bridge failed when high winds caused it to oscillate. The footbridge over the Thames was closed when we visited due to a design fault. Now to assemble the parts. By printing out a grid against the curves we wanted to make, we drew it to scale and sketched the curves onto several pieces of printer paper taped together. By laying waxed paper over that and using pins, we pinned the design and wax paper to a piece of 'foam core' ( get this at an art supply store). 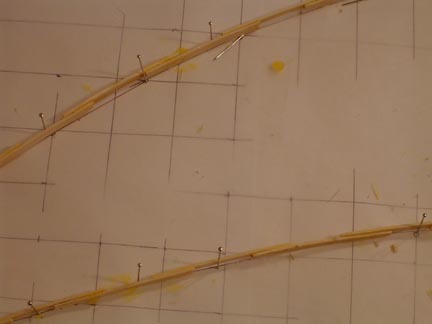 More pins can be used to bend the long straight piece along the desired curve. Pinning the arches to the foamcore allows the first connecting pieces to be added, assembling a 3d framework. The first 'flap' of the struts between the arches were assembled while still flat. Pins, waxed paper, and now paper clips are a great help to holding things in place while the glue dries. The glue outside the joint is just for show, it really doesn't enhance the strength of the connection. When working with 8th grade level construction crew, one has to let go. A trip to RadioShack gets us an amazing ally in the fight for great glue joints. Alligator clips! 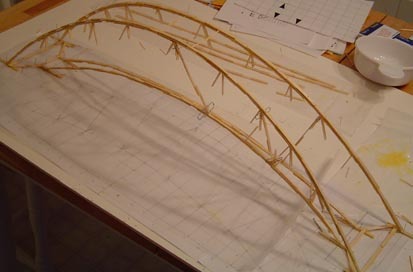 They hold the struts to the flaps and in this design, where the struts are not in the same plane as the arch, it was a quick way to make the connection. At this point the bridge still weighs less than 100 grams. The weight limit for this set of rules was 500 grams. The first bridge I helped out with actually was disqualified for being too light. 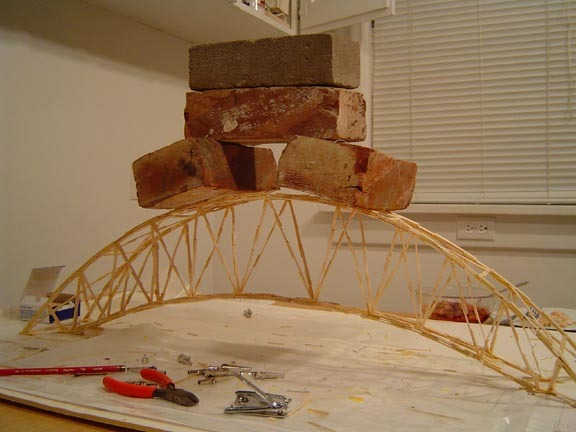 After adding some cross-bracing on the top, the span can finally withstand the weight of four bricks. We notice that the struts start to buckle. Our next step will be to beef up the struts. Well, it's time for the post mortem on our bridge. There are two vastly different kinds of bricks. One day before the contest, my son told me that his instructor was planning to use 'paving stones'. We had been testing with ordinary bricks which weigh roughly 5 pounds each. We 'beefed' it up to where it could easily withstand the weight of five normal bricks. Pavers have to weigh about 10 pounds each. 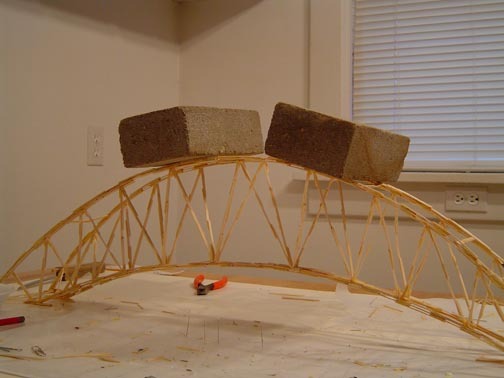 I am disappointed with the methodology of the bridge test. By loading bricks on top of students work, the instructor misses out on a great teaching opportunity. What is important to learn is what makes a good design, and what are the 'weak points' in the design. To find this, one must use finer methods of testing. For example, a bucket tied 1 inch off the floor from the span would allow one to learn from the failure and fix it accordingly. Crushing the work with bricks is entertainment, not unlike a monster truck rally. The bridge held 3 pavers and then collapsed on the fourth. 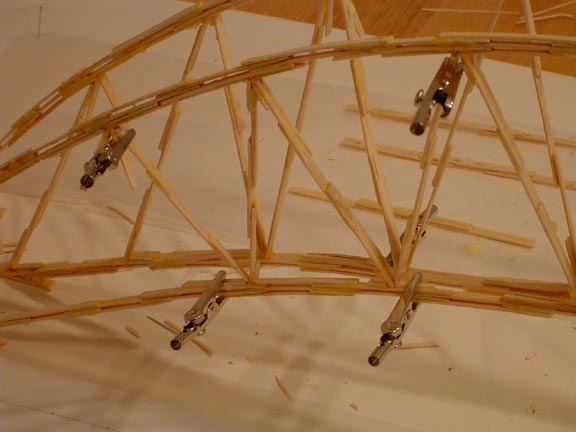 The bridges weight was slightly over 1/5 of the maximum weight limit. One thing to learn is to take advantage of every opportunity the rules allow. Use every bit of the weight if your goal is to win the competition. 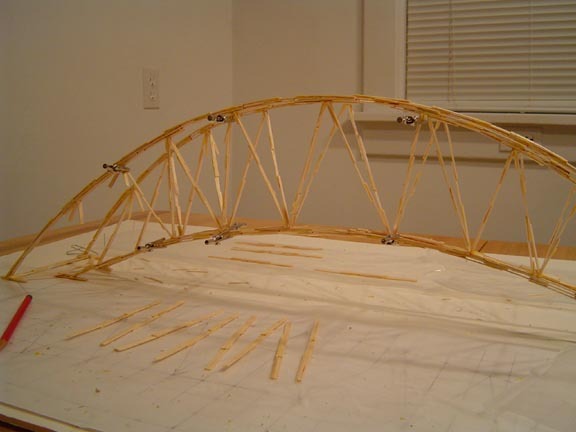 If your goal is to learn the physics of bridge design, don't enter a competition where 'lamination' into one giant board is allowed -- that is, unless you love the feel of elmers glue on your fingers. One very important concept that was apparently lost on my son's classmates is the ratio of the bridges weight ( unloaded) to the load that the bridge could withstand before failure. 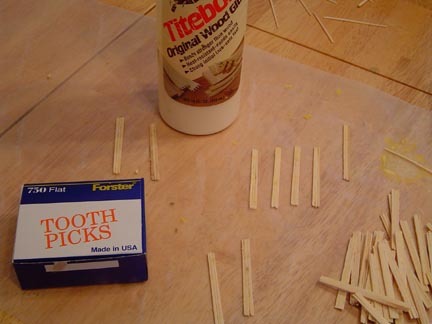 So far I feel sufficiently humbled to have lost two toothpick bridge competitions for two trusting students. Always too light!! One note for the future. Luckily I have other children who will benefit from our knowledge. The next design will be far superior to this one. 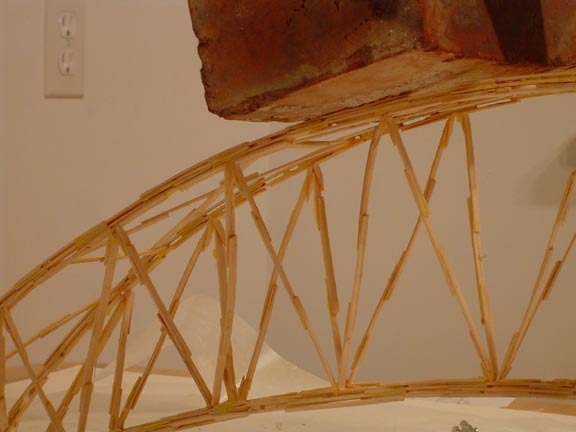 This bridge failed because the joints between the arch and struts failed. By orienting the building block so they are 'flat vertical' the strut connections will be much easier to make strong. All in all, I am sure my son learned more with my help, than he might have without it. I do wish he could have gotten the highest possible score, but I have found that getting all A+'s is not necessarily the most useful grades for later in life. While you're here, let me know what you think of this page in an email. If you would be interested in more detailed instructions or other designs, let me know that as well. I would like to hear about the rules for various contests and how the grading and testing is done. My name is and just click on it for my email.